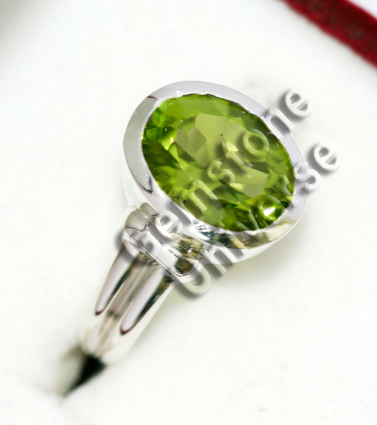 Natural inclusion free Jewellery Grade calibrated Peridot from Pakistan. Total gem weight 2.45 carats set in sterling silver 925 gents ring. Shipped to Patron in New Delhi, India. Final Price all inclusive USD ($) 150/ INR Rs. 6924/-. Peridot gives excellent results as an Emerald alternative. Statistically we at Gemstoneuniverse.com are of the opinion that Peridot is much superior alternative uparatna of Emerald results wise as compared to other gemstones such as Onyx and Green Tourmaline.